Home / Blog / Funner and Funnest? It’s tough being a grammar nerd. Because I am a reputed devotee of all things linguistic, I am held to higher standards by family and friends. I can take it, of course, because I tend to dish it out as well. I just feel sorry for my poor kids. They get it too. Recently I received a text from a concerned friend who was driving one of my teen-aged daughters around town and overheard her utter the word funnest (Shocking, right?). He couldn’t resist the urge to immediately text me about this shameful degradation of the language by my own flesh and blood. Question: Was my friend right in insisting that the proper comparative form should have been most fun? It’s not a simple answer, I’m afraid. 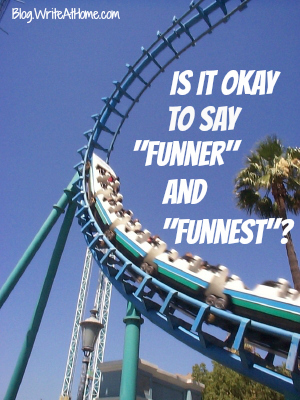 Traditionalists still dig in their heels and reject the use of fun as an adjective. So, they would frown upon such expressions as a “fun party” or a “fun time.” But the overwhelming flood of common usage inevitably wins out over the picayune pleas of these pathetic purists. (Ooh, that was nice. Read that again.) The fact is that fun functions just fine as an adjective and most dictionaries now accept this usage as normal. So, if we accept fun as an adjective (which my bothersome friend unwittingly admitted to by insisting on most fun as the correct expression), the question is: What are the correct comparative and superlative forms of the word? The rule is actually pretty consistent: One-syllable adjectives are made comparative by adding -er and superlative by adding -est, with a doubling of the final consonant necessary in some cases. That’s how it works for other one-syllable adjectives: tall, taller, tallest; wise, wiser, wisest, tough tougher, toughest, fat, fatter, fattest, etc. It seems logical to me, therefore, that this rule apply to fun, unless you dig in your hide-bound heels and refuse to accept fun as an adjective. In other words, there is no rational defense of “more fun” or “most fun.” Any questions? My daughter was exonerated. This, by the way, has been one of the funnest blog posts yet. Comments are the funner than roller coasters. Leave yours below! While I cringe at saying funnest, you present a very good case. Yay! Funner sounds a little funny, but I still use it all the time. Thanks for sharing the grammar info! My pleasure, Tulip. Thanks for reading and commenting.